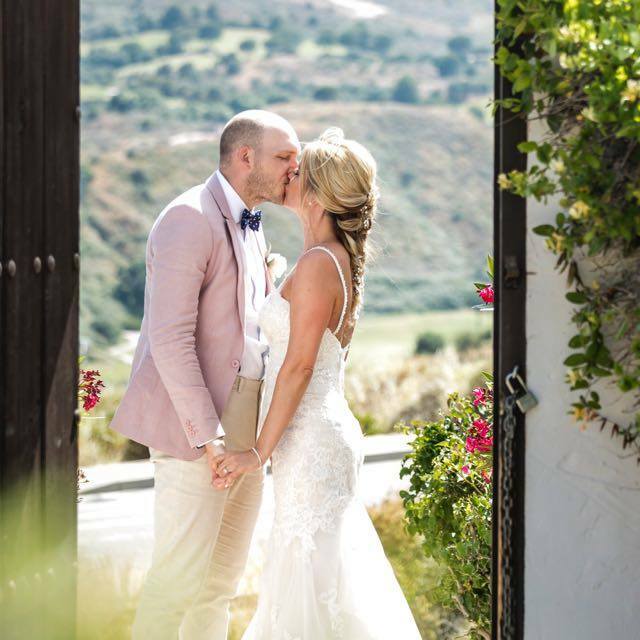 Sunshine Weddings were delighted to help Steff plan her dream wedding at the stunning Hacienda, set in the hills of Mijas, last summer. In today’s article, the bride reflects back on a wonderful day. Thanks for sharing your memories with us, Steff. Why did you decide to get married in Spain? We had always wanted to get married abroad and extend the experience as much as possible with our loved ones. Spain was a preferred option offering such reasonably priced/short flight times as well as pretty much guaranteed sunshine. Dazzling wedding photography set in the grounds of the beautiful Hacienda. How did the reality of your Big Day live up to the expectations of your dream? Exceeded! Being a wedding and event planner myself, my expectations were set high, however our dreams were delivered in the most professional, friendly and exciting way possible. What are your favourite memories of the gorgeous wedding venue, located up in the picturesque hills of Mijas? All of us chilling out around the pool the day prior to the wedding; relaxing, having massages, and sharing some valuable family time together. The extensive grounds of the Hacienda meant plenty of space for family and friends to enjoy themselves! How easy was it for your family and friends to join you in the sun for your celebrations? Very easy, everything was effortless and just flowed from start to finish. We are both very relaxed people and wanted our guests to enjoy the day without it being too regimented. Did you build in any fun events so you could all relax together before and after your wedding day? We all stayed at a hotel locally before both families checked into the Hacienda. We had a few nights of Karaoke and good fun with all our guests prior to the wedding. It was the perfect build up to the main event. Bride, groom and bridesmaid taking a quiet moment at the steps of the Hacienda. Can you tell us a little about your beautiful wedding dress… and its journey to the venue? I wanted a classic, simple lace dress, and after a year of shifting my ‘mum tum’, I couldn’t have felt any more beautiful. I opted for no sleeves due to the weather hopefully being glorious – which it was. As it was lace, it very nicely and carefully folded into my carry-on bag with no issues whatsoever. Who made your cake and was it everything you imagined? Having organised a second wedding party for when we arrived home with all of our friends and family attending, we decided on a more fun cake option for the actual wedding, which guests could enjoy later in the evening. The donuts went down a treat and everyone commented on how beautifully different this was. The happy couple steal a quiet moment set against a stunning backdrop. The Hacienda is one of the most magical and intimate backdrops in Malaga province, the perfect place to celebrate love. Are you pleased with the way your photographer captured its many elements in your wedding pictures? My husband isn’t the most forthcoming when it comes to photos – unlike myself and my daughter! 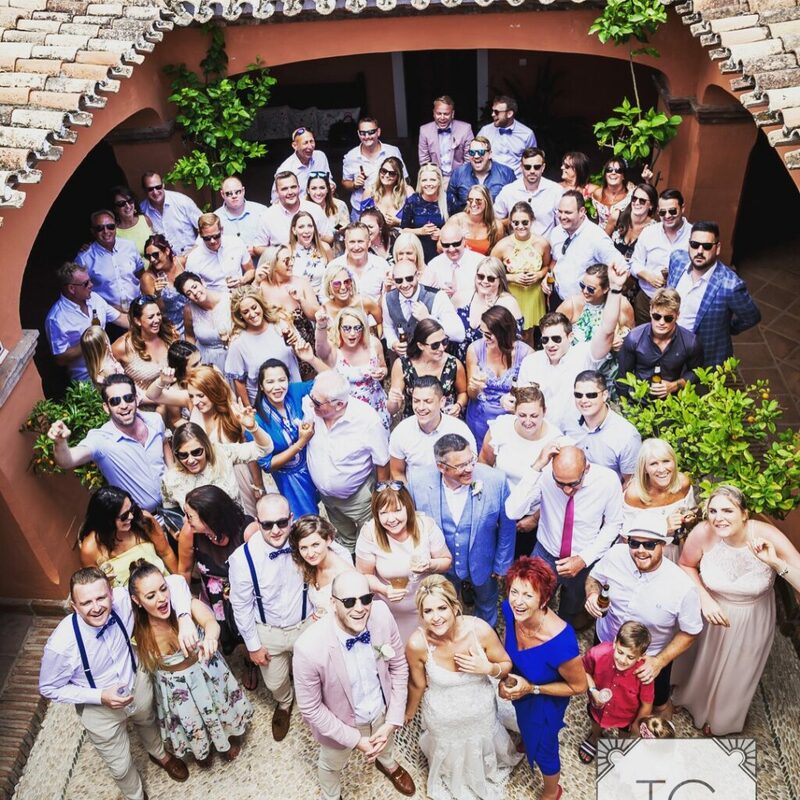 – but Talia, our photographer made the experience as comfortable as possible and we were delighted with the huge amount of photos that were taken. My favourites are the non-posing ones where guests are unaware of being snapped. We have some corkers! How was the weather, and did the bridal party’s hair and make-up stay put? The weather was very hot. The make-up and hair stayed in place; it was my shoes that I decided to remove after the photos, putting on my very comfortable CK sliders instead! They remained on my feet until the early hours, a very comfortable bride indeed. The bride is lifted by her groom and other male members of the bridal party! 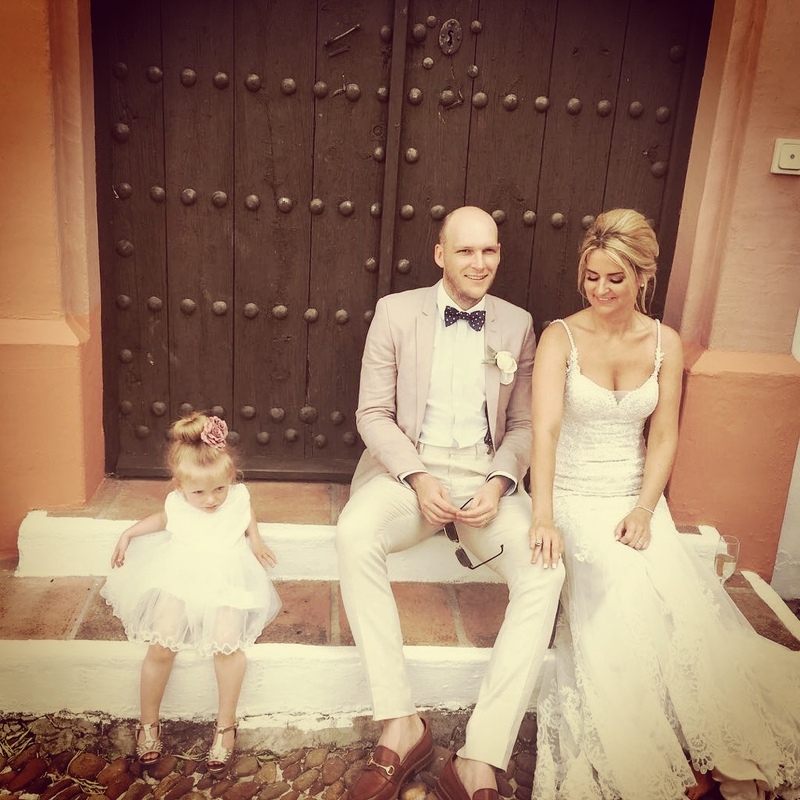 What advice would you give to other couples looking to tie the knot on the Costa del Sol? It sounds like an absolute fairy-tale wedding. Thank you so much for sharing the highlights with us!